Brian Car Sounds offer a professional audio upgrading service for your Bentley Motor car. We have expertise with all Bentley models from the Continental, Mulsanne, Flying Spur through to the latest Bentayga 4x4. Compatible with Bentley GT / GTC / SPUR 2004-2011. Direct Replacement for original Bentley Radio (all hardware supplied in kit). Everything you need supplied in one kit (navigation not included). 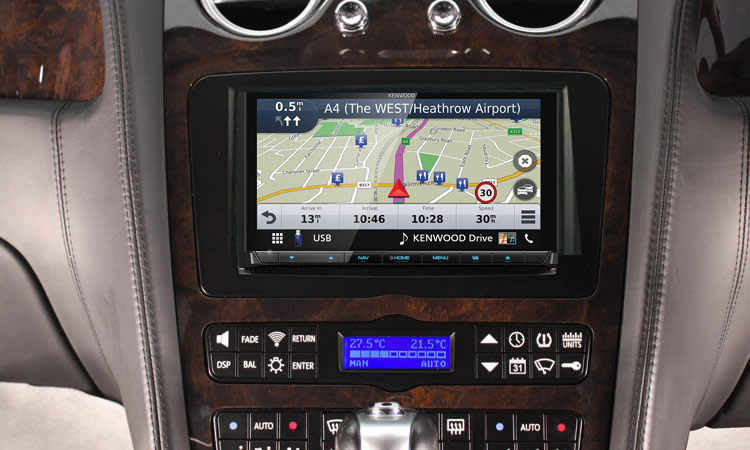 Designed and built in the UK using the latest technology, allowing you to fit any aftermarket double-din sized unit. 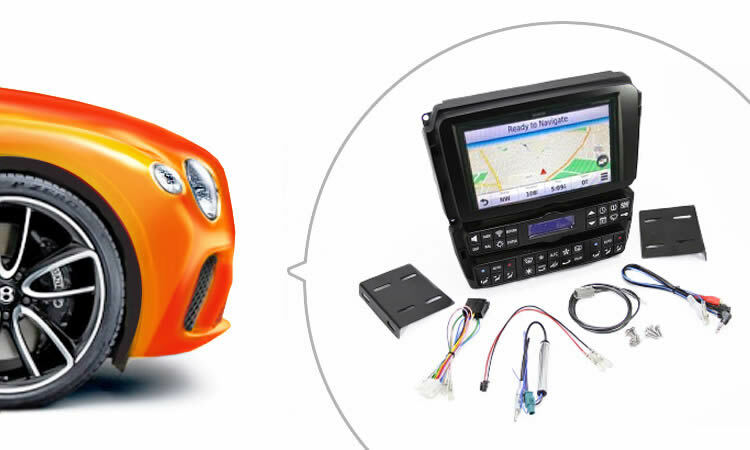 This kit also improves sound quality and retains the functions available on the original Bentley head unit (in easy to use format), including steering wheel functions (including tel call/end). This replacement kit supports Kenwood / Alpine. 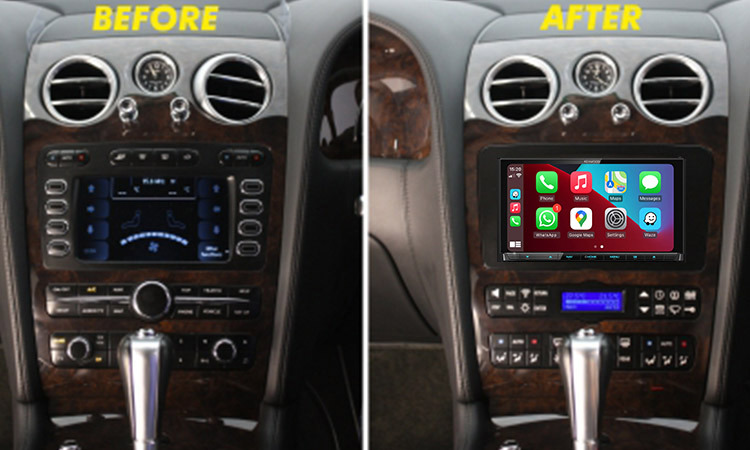 This package includes: Bentley Head Unit Replacement Kit, Touch screen double din stereo with Apple CarPlay, Android Auto, DAB/FM/AM tuner, Bluetooth Phone Calls and Music Playback. Starter package starting from: £2,299 supplied and fitted. 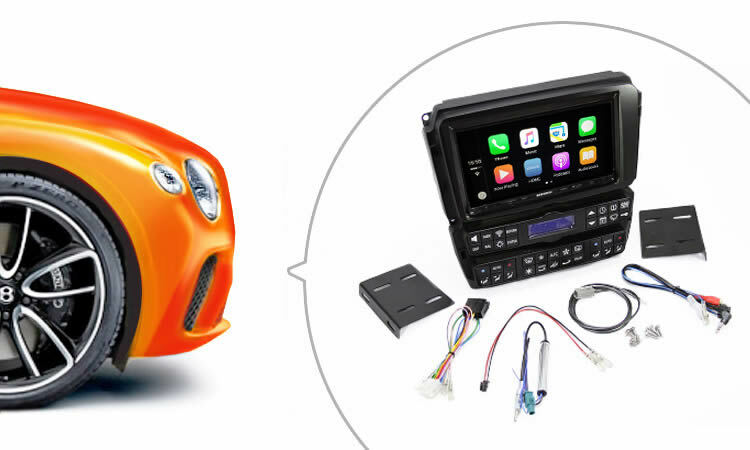 This package includes: Bentley Head Unit Replacement Kit, Built-in Sat Nav, DVD/CD Player, Touch screen double din stereo with Apple CarPlay, Android Auto, DAB/FM/AM tuner, Bluetooth Phone Calls and Music Playback, High Quality Audio. Advanced package starting from: £3,199 supplied and fitted. Brian Car Sounds have a wealth of knowledge fitting replacement kits to customers' Bentley motor cars with excellent results. If you'd like something custom for your Bentley, please feel free to call us on 020 8645 0655 or pop in to the shop for a chat about your ideas. We will take the time to listen and make a system perfect for you. B.C.S.S. Car Sounds Ltd is registered in England and Wales No. 05431629. Registered office: 186-188 Brighton Road, Coulsdon, Surrey CR5 2NF. B.C.S.S. Car Sounds Ltd acts as a credit broker and only offers credit products from Omni Capital Retail Finance Ltd.
B.C.S.S. Car Sounds Ltd is authorised and regulated by the Financial Conduct Authority. Our registered number is 737893. Credit subject to age and status.